It was blazing hot, and The Spice Hater (aka my daughter E.) was eating dinner with friends. So I seized the opportunity to indulge in a little hot pepper action and mixed up a batch of super-spicy black bean-potato salad and let it marinate in the fridge until very cold. It tasted wonderful to my heat-seeking husband and me. But if you don’t like things quite so spicy, be sure you cut down on the chipotle and jalapeño peppers. It’ll still be tasty but won’t burn going down! Combine 1 teaspoon ground flax seed with two tablespoons hot water in a small cup or bowl and set aside to thicken. Place potatoes in a saucepan, and cover with water. Bring to a boil. Reduce heat; simmer 20 minutes or until tender. Drain; cool. 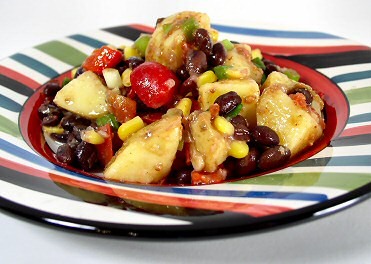 Cut potatoes into 3/4-inch cubes. Place potatoes in a large bowl. Add corn, red pepper, onions, black beans (rinsed and drained very thoroughly), jalapeño pepper, and tomatoes and mix well. Remove 1 chipotle chile from can. Chop chile to measure 1 to 2 tablespoons. (Reserve remaining chiles and adobo sauce for another use–I like to mince them and freeze them in ice cube trays.) Combine chopped chipotle chile, flax seed mixture, lime juice, garlic, salt, cumin, chili powder, and black pepper, stirring with a whisk. Drizzle the lime juice mixture over potato mixture, and toss gently. Cover and chill for at least 1 hour, stirring every now and then. Taste and add more lime juice as needed before serving atop mixed greens, if desired. Nutrition (per serving): 273 calories, 10 calories from fat, 1.2g total fat, 0mg cholesterol, 587mg sodium, 1312.2mg potassium, 56.3g carbohydrates, 11.6g fiber, 2.2g sugar, 12.2g protein, 7.9 points. Note to Eat to Livers: One serving of this should equal your starchy vegetable serving for the day. I love this recipe – it is always a hit! I am going to make it for a barbecue next week. Thanks! This is lovely. It’s a versatile recipe too. I’ve just made a version where I added some nayonaise to create an aioli sauce, used half sweet potatoes, replaced the corn with peas, and replaced the tomato with even more red pepper. Although I left the chili pepper and jalapeno out, it’s still probably too hot for the kiddos at a vegan family potluck we’re attending tomorrow. But I think it’s perfect. Hi Susan. I was growing up on polish food where was no such thing like fat free. Taste was the most important at any cost! So when , few years ago I was changing the way I eat I try to fallow so many blogs and website’s .Was not easy, specialy for my family. Today , I’m not expert , but least I know what I’m doing only thanks to you. Today I use your recipe over and over again, I found them very tasteful easy and there is no complains from my husband!!!! This salad is another keeper specially on hot day like today. Thank you very much for sharing with all of us and sorry for my English. I skipped the garlic, corn and chilli powder and used small whole potatoes (pressure cooked) instead of red potatoes – the salad was still awesome. Outstanding! I toned down the heat quite a bit and added just a bit of nutritional yeast. I loved it! Thanks for another wonderful recipe! Love this!! I only used one can of beans, ditched the tomatoes, and added some cilantro. Very yummy!! I literally just made this (it is still in the marinating phase), but I sampled and it’s a great blend of spice. I only had sweet potatoes, so I used those instead of red skins, and like one other commenter I only used one can of beans and added some cilantro. I love your receipes !!! All of them !! So simple , !! Susan, this looks great, I can’t wait to try it! Do you have a resource for chipotle chiles in adobo sauce without added oil? Another great recipe … really awesome flavour. Very much appreciate all your recipes and tips.